Of all the countries in the world that could get this right, Norway is surely number one. In many areas of human endeavor, the tiny country of Norway (population 5.2 million) excels beyond all expectations — being one of the first to win the coveted top position on the UN Happiness Index, likewise on the Social Progress Imperative (SPI) an index that measures quality of life metrics, and in many other ways Norway is an ongoing success story. Norway ranks very highly on per capita income, on the safety and security of its residents (it averages 1 murder annually) and it’s the go-to arbitrator for countries experiencing internal or external conflict. And almost unheard of anywhere, Norway donates 1% of its GDP to foreign aid. Citizens enjoy a high standard of living, the country features a highly-ranked healthcare system and it also offers tuition-free university education for all residents whether they’re native Norwegians or not. Norway seems to enjoy a permanently healthy economy with a 2.5% unemployment rate, while the country’s pension fund shows a +1 trillion dollar surplus which is sometimes used to fund government infrastructure or joint public/private projects in Norway. Because Norway is so advanced and is such a safe and wholesome place to raise children, many European executives live in Norway and fly to and from their EU office daily. Others work the entire week in the EU, returning to their families on the weekends. Even when compared to the EU which is one of the pinnacles of human civilization, Norway continues to stand out as an example of ongoing excellence in governance and environmental stewardship. For all the political posturing that has been going on around the world over the past year, nothing has changed for the Rohingya people. And a year from now most politicians and pundits will still be chuntering on about the terrible conditions in Myanmar where several hundred thousand Rohingya people have fled across the Bangladesh border only to become encamped in the mud, living in miserable ‘homes’ made out of whatever floated down the river that week. The tragedy in Myanmar has been going on for decades and the genocide in the country will continue regardless of the endless talk among the world’s politicians. Nothing will be done. 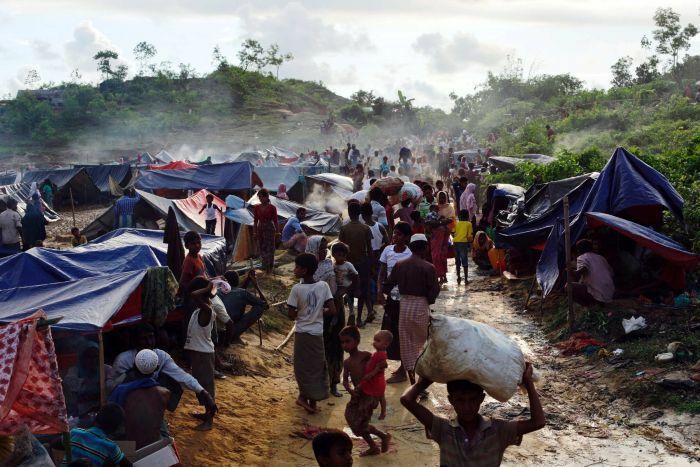 The Rohingya are finished in the absence of outside assistance. What Could Norway Do for the Rohingya? Because nobody knows what to do, Norway will have to set the example for other countries. The country could build a community in small-town Norway to show countries how to help refugees — a working model that’s people-based — because the Rohingya are human beings. They’re not faceless numbers on a chart. It’s time for some of that Norwegian excellence to shine through! If the Norwegian government, acting with one or more investor groups, built an apartment complex near Bodø to hold 1000 Myanmar refugees complete with a recreation centre, an indoor swimming pool, an outdoor ice rink, a medical/dental clinic, some minor food and clothing stores tailored to the specific needs of the Rohingya, and an auditorium (which could also serve as a basic schoolroom during weekdays) Norway could admit 1000 Rohingya for a strictly time-limited 6 month period. The Rohingya could have all their medical, psychological, and dental needs attended to — and the payoff for Norway is that the country’s future Doctors, Psychologists, Dentists, Nurses and more, could gain plenty of experience in the treatment of those patients during the required practicum portion of their education. After 6-months, those 1000 refugees would return to Myanmar or Bangladesh in much better health, with more education, and a better understanding about how Western society works. And after a three week cleanup and repaint interval (as required by facility administrators and maintenance staff) a completely different set of 1000 refugees would arrive in Bodø and the process of helping Rohingya would begin anew. In effect, relatively small groups of Rohingya would spend 6 months away from (what is basically) Hell on Earth in Myanmar and southern Bangladesh — and also provide a minor boost to the Bodø economy. Yes, Norway would need to divert some of its foreign aid budget to building such facilities (Bodø construction companies would love it!) and provide the Rohingya with some minimal income to spend in Bodø stores (for those Rohingya who want to venture into the town) and some strong and able Rohingya men might want to volunteer for clearing Bodø sidewalks of snow in the winter, etc. and such volunteerism should be strongly encouraged by the administrators of the 1000-person complex. The Rohingya would arrive in Norway courtesy of the Norwegian government, be housed, receive medical care, learn basic Norwegian or English language, see how successful societies work, learn about and practice volunteerism, understand the Western mindset of ‘Can Do’ vs. ‘Can’t Do’ and return to their country brimming with new ideas and enthusiasm to make their country better. Their default mindset will thenceforth veer towards the obvious success story they witnessed in Norway instead of being easily-led to disaster by the military strongmen and religious fanatics common in their home region. Norway can spend 20 million dollars (for example) to help the Rohingya encamped in squalor in southern Bangladesh where it will get very little value for the money — or it can spend 20 million dollars in the Bodø economy and help 2000 Rohingya per year, and thereby provide a significant benefit to the refugees and to the businesses of Bodø. One way (the typical way countries help refugees) is about ‘working hard’ to help refugees within their own conflict-ridden country, while the way I propose is about ‘working smart’ to help strictly-limited numbers of refugees that have been transferred to Norway. Years from now when the Rohingya crisis is over, Norway may have helped 10,000 or even 30,000 Rohingya refugees doing it the ‘smart way’ — and that Bodø facility will remain and be available for other refugee groups in the future that the government of Norway may invite for short-term stays and once again boost the Norwegian economy. By diverting $20 million from Norway’s annual foreign aid budget to help refugees (but helping them within Norway, instead of helping them in Myanmar or southern Bangladesh) 2000 Rohingya per year could receive excellent medical, psychological and dental care from Norwegian pre-med students, the refugees could have a rest from their deplorable living conditions, learn about the Western ‘Can Do’ mindset, experience an ultra-successful culture in Norway, learn about volunteerism and return to their own region knowing that Norwegians care about them and those Rohingya will thenceforth find extremist archetypes far less appealing for the rest of their lives. And that’s a win for everyone! Previous Previous post: Is NAFTA a Bad Deal for America? Next Next post: The Iran Nuclear Deal: Obligation or Opportunity?